(CNN) -- It sounds like something from the movie "Twister" -- teams of scientists in vans, armed with high-tech measuring equipment, barreling across the Oklahoma plains in search of tornadoes. 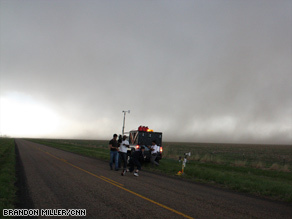 A V2 team measures a storm this week in the Texas panhandle. But these scientists are colleagues, not rivals, and these storms aren't Hollywood digital wizardry but the real thing. Welcome to VORTEX2, or V2 for short, the largest and most ambitious field experiment ever devoted to studying tornadoes. Now under way through June 13 in Oklahoma and surrounding states, the project brings together almost 100 scientists and students from 16 universities and research institutes. VORTEX2 kicked off Sunday, and its teams didn't have to wait long to find the targets of their research. Violent storms tore through four Midwestern states Wednesday, killing three people in northern Missouri, according to Kansas City affiliate KMBC. The storms damaged dozens of homes and left thousands without power. "Data collected from V2 will help researchers understand how tornadoes form and how the large-scale environment of thunderstorms is related to tornado formation," said Louis Wicker, research meteorologist with the National Oceanic and Atmospheric Administration. V2 is a $11.9 million program funded by NOAA and the National Science Foundation, 10 universities and three non-profit organizations. The project is a successor to the original VORTEX field program, in 1994 and 1995, that documented the entire life cycle of a tornado for the first time in history. The research helped improve tornado warnings by the National Weather Service during the late 1990s. "An important finding from the original VORTEX experiment was that the factors responsible for causing tornadoes happen on smaller time and space scales than scientists had thought," said Stephan Nelson, NSF program director for physical and dynamic meteorology. Researchers will present preliminary results from V2 this fall at Penn State University. At that time, organizers also will begin planning details of the second phase of V2, scheduled for May 1- June 15, 2010. This spring's V2 teams are chasing supercells -- violent thunderstorms capable of producing damaging winds, large hail and tornadoes -- that typically form over more than 900 miles of the central Great Plains, from South Dakota to the Texas panhandle and from eastern Colorado to western Missouri. The researchers try to locate these explosive storms and surround them with an armada of high-tech instruments, such as radar, weather balloons, barometers and computer programs, to gain a three-dimensional picture of how the storms form and mutate. A hook echo is a secondary, curving storm pattern that shows up on radar, wrapped around a larger storm. "The big mystery is the concentrated rotation of the tornado itself. Where does that come from?" University of Oklahoma graduate student Owen Shieh told CNN. "Does it come from the temperature differences, the buoyancy differences between the cold air and the warm air inside the super cell? Exactly how that works, we don't know." The scientists and students of V2 hope that by improving their understanding of tornado formation, they will be able to help forecasters alert residents more quickly -- in time to keep them safe. "If you don't understand storm structure, you should not attempt [this]," Richter told CNN. "It could be rather dangerous if you tried."